“I am sorry, but there is a softball-sized mass on your chest x-ray.” These words forever changed my life. The next day, I was sitting in a first-year medical school lecture, and I remember feeling so utterly and completely isolated from the other 100 students in the class. Akin to being stranded on an island on a different planet in a different universe. We suddenly had nothing in common. All my friends were anxious about the upcoming final exam, while I was questioning whether I would be alive in six months. But, once I recovered from the initial shock and grief of the realization that I was suddenly and unwillingly enlisted in a battle against Hodgkin’s lymphoma, I did the only thing I knew how to do: established some goals. Goal #1: Beat cancer. Obviously! Goal #2: Maintain some element of normalcy in my life. As the chaos of this war against cancer ensued, I attempted to minimize its disruption in the other areas of my life. I completed my summer research project and carried out my already-planned wedding proposal for my wife that summer. I just wanted to keep moving on and look back as little as possible. Cancer was this terrible thing to happen to me, a tremendous bout of bad luck, but I did not envision it defining my life moving forward. At the same time, I knew I could not just pretend it was not happening. The battle was forever changing me, and even though it did not exclusively define me, those wounds were ever-present. And further recognition of that pain always brought me back to the lecture hall, feeling isolated and alone. So, I struggled on how to integrate being a cancer survivor into my personal identity, and subsequently often ignored this internal dilemma. However, a little more than one year after my last chemotherapy session, I participated in Chicago’s Light the Night. As I walked the course, looking at the faces of my friends and family, the walls of isolation finally began to break down. In that moment, I genuinely realized that it had never been “me vs. cancer”; it had always been “us vs. cancer.” And just as we battled the disease as a team, we needed to heal as a team. Furthermore, as I interacted with countless other fellow survivors, a deluge of suppressed emotions surfaced, and I began to sincerely appreciate the sheer enormity of the events of the past one and half years. I left that night with a newfound sense of pride in a journey that I had been previously evading in my mind. This past September, I celebrated 10 years of being cured from cancer. This was a decade of life lived that was never guaranteed to me. A decade abounding with blessings. 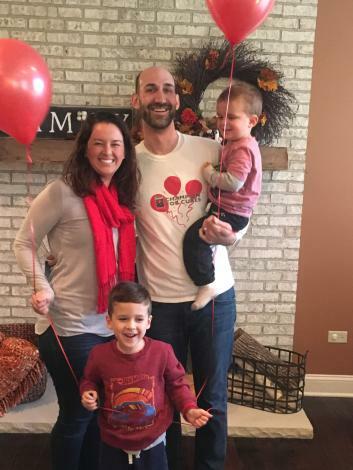 I married my best friend, we overcame infertility to become a family of four, and I was able to complete the long road of training to become a physician. My family, friends, and I again celebrated Light the Night this October. However, this time, I stood before them, not as a survivor filled with melancholy or conflicted emotions, but with unceasing gratitude.